When you anticipate a worst-case scenario, you create unnecessary anxiety. Dr. Boyes of Psychology Today has written that catastrophizing is a common cognitive distortion in which you predict a negative outcome followed by a catastrophic result if that negative outcome were to occur. For example, I tend to feel anxious when driving in the snow because I have certain catastrophizing thought patterns. I assume that if it’s snowy, I will encounter unsafe road conditions and I will get into a car accident. In a matter of seconds, I’m convinced that the inevitable accident will lead to severe physical injuries, even death. What started as typical nervousness associated with driving in snow has become severe anxiety — simply due to my catastrophizing thought patterns. Maybe you think this way of thinking is necessary or even helpful. Some people believe that imagining the worst possible scenario will help them to be prepared. Clinical psychologist Linda Blair has stated that catastrophizing is “a protective mechanism because we think ‘if I think the worst, then when the worst doesn’t happen, I’ll feel relieved.’” And yet, if the worst outcome does not occur, any relief that you might feel can be overshadowed by the anxiety that was created in the process. Even if your worst nightmare comes true, imagining it beforehand isn’t likely to help you to cope. Instead, “you’re living through an experience twice,” Blair contends. “So, in the end, it really isn’t very protective. It causes great anxiety.” In short, catastrophizing simply creates anxiety that does not help to protect or prepare you. 1) Increase your awareness. The first step is to recognize catastrophizing thought patterns when they occur. Your first sign might be that you’re feeling something different, such as fear, anxiety, stress, or irritability. Try to identify whether you’re catastrophizing—jumping to the worst possible conclusions—in that moment. 2) Name it. If you see that you’re catastrophizing, it might be helpful to call it by its name. You can simply say to yourself, “I’m catastrophizing.” This can help you to separate your distorted perceptions from more realistic thought patterns. For some of my clients, simply calling catastrophizing by its name when it occurs helps to stop it in its tracks. 3) Consider additional outcomes. You’ve already identified the worst-case scenario; now you need to consider what else could happen. What’s the best-case scenario? What are some outcomes that would be bad but not catastrophic? Let’s go back to my example about driving in the snow. I came up with the following possibilities: One, nothing bad will happen, and I’ll arrive at my destination without incident. Two, the car will skid a few times, but I won’t get into an accident. Three, I’ll get into a fender bender but won’t be hurt. Four, I’ll get into an accident that causes significant damage to my car but no significant injuries to myself. That’s not great, but it’s not a catastrophe, either. Considering other outcomes in this way can help to manage catastrophizing. 4) Distinguish between unpleasant and catastrophic outcomes. Dr. Boyes suggests that being aware of the difference between an unpleasant event (getting into a minor car accident) and a catastrophic event (being seriously injured in a car accident) is the key to overcoming catastrophizing. If you recognize the possibility that an unpleasant event could occur instead of a catastrophic event, this could help to alleviate your anxiety. 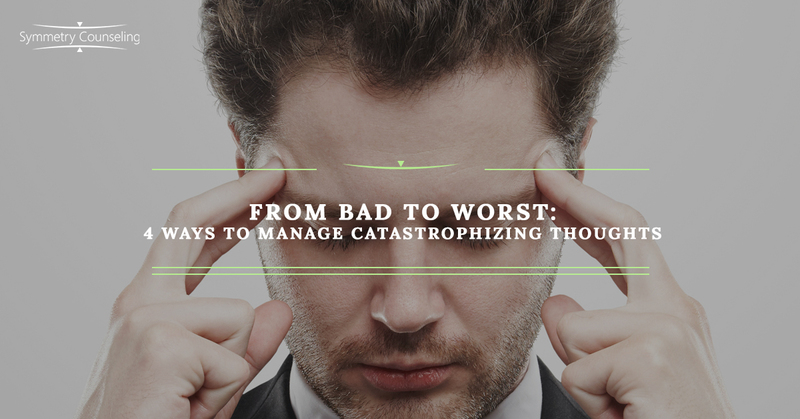 Catastrophizing thought patterns create unnecessary anxiety. But they can be managed when you learn to recognize them. If you experience catastrophizing thought patterns, you might benefit from participating in counseling. Symmetry Counseling has therapists who specialize in anxiety treatment. Contact Symmetry Counseling at 312-578-9990 to schedule an appointment.